The final week before finals, the final frontier finally here in its final fantastic form. The Summer Tournament has seen some stiff competition with teams playing the most elaborate game of leapfrog imaginable. Titans were toppled, the rabble were raised high and lauded, the mediocre marginally maintained their ground. It was an action filled weekend, but the best is yet to come. In case you’ve missed it, here’s the information you need for the Wildcard Tournament and Finals. The finals will be take place over the space of a weekend with best of three semifinals on Saturday 5th September and the best of five grand final on Sunday 6th September. In the words of Robin Williams, it’s going to be “Hot, damn hot!” as the best of the best bring their best to the stage. Now that’s all very exciting, but without further ado, here is your weekly roundup of all the goings on. It was a sad week for Amir Is Toxic as they were finally deposed by We are feather feather feather getting back together. Huddersfield White also climbed above them while Staffs Enerds secured their 4th spot and thus two byes in the Wildcard Tournament. Icey Dead People and the Sunderland Sneakbeards dropped out of the wildcard placings altogether leaving the doors open for Droolio and the Gang to secure that last bye slot. Here are the teams that have qualified for the Wildcard Tournament and Finals. I said there was a major game of leapfrog occurring and this can be seen in our list of the biggest winners last weekend. Bench Freddy managed to jump five places to 10th and secure a Wildcard Place. Droolio and the Gang went even further overtaking eight other teams to secure their place in Post-Season as a result of their superb run to last week’s final. Meanwhile the UEA Memers managed to equal Bench Freddy, jumping five places to make it to 25th. 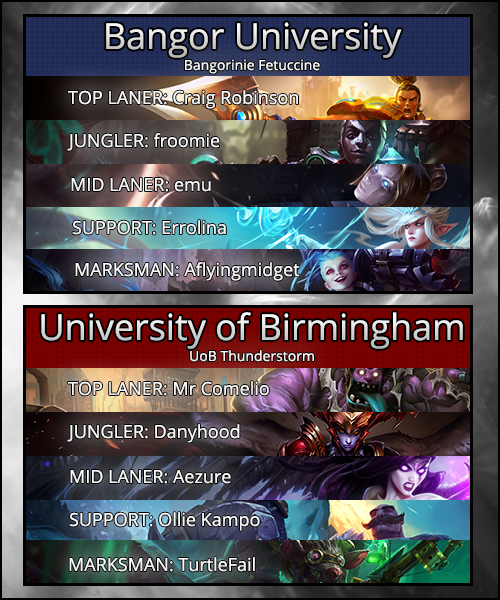 Honorable mentions go to UoB Thunderstorm (University of Birmingham), Northern Alliance (University of York) and Staffs Salt (Staffordshire University) who all managed to leap four places in the standings. This match was a huge clash for a place in the Wildcard Tournament. Sat in 10th and 13th, the stakes were high for both teams as they entered the Rift. The game saw a quiet start as players were content to farm. Spectators had to wait five minutes before first blood went to Dr-turned-businessman Mundo after Xin Zhao attempted to fight off a gank from Shyvana. As soon as Shyvana showed herself in the top lane, Ekko ganked bottom, Janna getting the final hit on TurtleFail to secure the kill. A lovely binding by Morgana in the middle lane burnt Orianna’s flash, but a greedy flash auto failed to secure the kill leaving Aezure pounding the keyboard in frustration. Thus a very eventful fifth minute concluded on the Rift. Two minutes later, Shyvana made a return gank onto the very vulnerable level five Xin Zhao in the top lane and secured a kill for Danyhood’s Shyvana. However, with the jungler’s presence revealed, Ekko was safe to gank the middle lane. With Aezure’s Morgana out of position it was an easy kill and despite putting up a fight, Orianna secured the gold with ignite. With a slight lull in affairs the casters turned to Danyhood’s very questionable purchase of the Poacher’s Knife. Yet this lull was short lived as Ekko made yet another attempt to impact the bot lane. However, this time Bangor came out empty handed as Parallel Convergence landed just a little too late to stun the enemy bot lane. In an attempt to bring his team even, Shyvana returned once again to the warded top lane to relieve some of the pressure Xin Zhao was piling onto Mundo. Failing to spot his impending death, Xin bravely fought back and picked up a kill onto Shyvana but Mundo was able to pound him into submission with his sizeable pension and economically sound business plan. It was a short wait for the next piece of action as Corporate Mundo decided bottom lane needed a stimulus package, teleporting behind the over-extended Jinx and Janna. Smart use of the Braum passive landed a kill for Mundo and a much-needed kill for a Twitch that had been pushed in all game due to a less than stellar matchup. The red team succeeded in taking the dragon despite a close shave with a Jinx rocket and everything was looking good for Birmingham. With the dragon left smouldering on the ground, the champions returned to their lanes. Yet this peace would not last forever as violence returned to the side lanes. Ekko ganked the increasingly threatening Mundo while Jinx and Janna rained critical strikes onto Twitch. As directed camera did its best dance to Taylor Swift’s “Shake It Off” it all went quiet, Mundo flashing to safety and Twitch stealthily evading further punishment. TurtleFail’s Twitch was not happy about being bullied in lane and hatched a cunning plan. With only a lane ward in the first bush, he took advantage of his stealth and ambushed Jinx in a vulnerable position. Braum landed the Winter’s Bite and sent Aflyingmidget into the sky with Glacial Fissure. Jinx barely had time to land before Twitch finished the job. The twenty minion lead that the Bangor bottom lane had built up was wiped out in an instant. But as one play ended another began as a gank from Shyvana caught Xin out of position, again walking over a ward on her way in. In fairness, there was little the Seneschal of Demacia could do due to Shyvana’s speed, but with no built in escape some care might have proved more beneficial. This gave enough time for Jinx to return to lane only for Twitch and Braum to rinse and repeat – another kill to Birmingham and it seemed as though they were slowly running away with the game. Ekko tried to gank top lane, but Mundo went where he pleased and nothing was gained. The bottom lane turret went down and the Birmingham lead extended. With the first turret down the mid game approached. It was proven very quickly that flying midgets were not the best learners as Jinx was forced to flash by another Twitch ambush. The Bangor threat on the bottom side of the map was so significantly reduced due to having a flashless and almost lifeless Jinx the jungle was effectively Birmingham territory. However, Orianna had not quite got the memo as she stepped into the dark. Lo and behold a bright light appeared. A burning bush? No, just a Mundo teleporting to a concealed ward. The Lady of Clockwork flashed the Brambleback pit, but found herself staring at a disapproving Morgana and a rather intimidating Braum. The other three members on the bottom side of the map tried valiantly to save her, but to no avail as froomie’s Ekko couldn’t quite turn back time. Some credit must also go to the Twitch play of TurtleFail as he succeeded in isolating Ekko, zoning out both Janna and Jinx during the fight. Xin Zhao up top answered with two towers, but with multiple kills, a dragon and another tower going to Thunderstorm things were looking dire. A 4.2k gold lead was not to be sniffed at. Well I said flying midgets could be slow learners and Jinx proved it once again getting caught out again in the middle of the map by a Twitch ambush. While the team was able to rush to her aid, she did fall to Shyvana. Janna quickly followed suit, Aflyingmidget not respecting the possibility of a stealthed Twitch lurking nearby. Thus bad positioning cost Bangor another tower and two team members. Both sides of the jungle cleared, a fifty creep differential had opened up between Bangor’s Ekko and the now sated and very threatening Shyvana. Birmingham now had an 8k gold lead and were looking good for it. A catch and kill onto Janna a minute later did not help Bangor’s situation. Having picked up a whole load of gold Shyvana purchased the Dead Man’s Plate, perhaps a signal of intent. The upfront damage the item gave was plain to see as she was able to chunk out two enemies with only a couple of autos. With Bangor perhaps slightly more wary of the dangerous dragon and the possibility of a Twitch ambush, they kept their distance. However, Thunderstorm were determined to fight. While Janna went down attempting to disengage, Aezure’s Morgana overextended. Happy with a one for one trade, this was some much needed pain relief for Bangor, though in terms of scale, it was more like paracetamol for a gunshot wound than a bandage. There was little discernable difference in the state of affairs, but Bangor felt safe enough to creep out of their base. They made it as far as the outer turret in the middle lane before encountering resistance. With Braum split up from the rest of the team, they quickly isolated him, but a quick collapse from the other Birmingham members meant a three for three trade, only the damage of Twitch managing to keep the fight even. Bangor could sense they might have a chance. Another teamfight later saw Birmingham think twice about their lead as froomie’s Ekko landed a beautiful Parallel Convergence to stun the front line while Craig Robinson’s Xin Zhao made Swiss cheese of the more squishy members of the red team. A great fight for Bangor and a slight comeback. The gold lead was reduced to 6k and Birmingham were looking slightly more apprehensive. With Thunderstorm a bit more wary of what Fettuccine could do, they grouped up on the top side of the map and pushed for the turret. Bangor had renewed confidence after the last fight and were eager to impress. When it seemed Birmingham had overstepped their mark, Ekko went for another clutch stun, but only managed to land it onto Braum. With Twitch raining damage from afar and the tanky frontline soaking up damage from both tower and team, the red team were able to outlast the blue team. Only Ekko remained as Thunderstorm pushed down the turrets. Mundo could not quite go where he pleased as he fell to the laser turret, but he was avenged in the form of an inhibitor. Having recalled and respawned, the teams regrouped around dragon. Though Birmingham were melting through it, Ekko managed to quickly steal it and Chronobreak, preventing what could have been an important fourth dragon. Still, they were forced back to base and holed up behind their turrets. The waveclear was strong and they held firm. Birmingham saw this and decided that the turrets were not worth the trouble, instead taking a comfortable Baron. With Baron picked up sieging was made a lot easier. With team members pushing all lanes, Bangor tried their best to clear the empowered minions, but to no avail. Xin Zhao was caught out next to his turret and shut down by Twitch. Birmingham played it safe taking all three inhibitors, recalled and came back for more. A free dragon later and a quick siege meant Thunderstorm secured the win. There were a few contenders for the MVP award. Notable mentions have to go to Danyhood’s Shyvana and Mr Cornelio’s Dr Mundo, the synergy between the two players being shown time and time again. However, our very own caster on the day, scaredcrow, has nominated Turtlefail for the prestigious MVP award stating, “TurtleFail: Never have I predicted something as wrong as him losing lane. To be honest, it was a losing matchup; he was facing a Jinx; was going to be outranged and yet… He stayed even for a small portion of the game; until completely blowing her up the second she mispositioned to get cs. He was SO punishing in lane and never allowed her to push beyond river when he had brush control. His lane dominance crippled the Jinx that was the hyper carry potential on the opposing team; one that could have potentially turned around the game since top was so fed. Again the entire team played well in this series; and it was a stomp; so decisions like these are hard to make.” Congratulations to Turtlefail, you are our MVP of the Week, a very deserving winner. Good luck to everyone involved in Post-Season and watch this space!